It turned out Sunday ended up not being so good for Sella either, and I had gotten wrapped up in a painting, so I had another studio day. Then Monday was spent getting ready for the solo exhibition Noemi had arranged for me in La Casa Museo Orlando Hernandez (The Orlando Hernandez House Museum); we got the keys to the place from the local government and scoped it out, prepared the exhibition room, and got double-sided mounting tape to help secure my pieces to the walls. Tuesday evening was my opening, but that morning Noemi had arranged for me to visit the northern part of the island's recycling center for a tour as a part of a group (she had originally planned to come as well, but ended up needing to sit for state exams that day). I was a little skeptical of how interesting it would be and also had yet to install the artwork or shop for the reception refreshments, but Noemi said she thought it would take around an hour and really wanted me to go. So I went! It actually took three and a half hours, and only about half an hour of it was interesting (touring the actual facilities). The other three hours involved watching videos and protracted lectures and Q&As about the importance and minutiae of recycling - in my case, at least, preaching to the bored choir. But I got back with - just! - enough time to eat lunch, install my artwork, and run to SPAR to buy some refreshments. The reception went well, and then the rest of the week I babysat the exhibition (with no internet) and started some new pieces from within the exhibition itself - a sort of performance art in its own way! On Friday I did an artist lecture and a demo of QuickCure Clay, and then later on another exhibition opened up in an adjoining space, and their reception also flooded over into mine and I had a hopping second reception-of-sorts as well. Over the weekend Noemi took me to the north to see the towns of Arucas and Gáldar, and we visited the Painted Cave museum, where we got a chance to glimpse aboriginal cave paintings from a carefully monitored chamber so as to attempt to preserve what's left of the paintings after severe degradation from tourists during the late 70's and 80's. Noemi also thought I should try paragliding, so she arranged for a friend to take me up in a tandem parachute! I'm up for new things, so I did it, and I'm glad I had the experience - but I didn't enjoy it very much. I get pretty motion sick, and the turning and swooping set it off quite strongly. I also got bored with it after the first few minutes - we just sort of looped back and forth over the same bit of land, and once I'd taken it in... the views were extremely similar to what you'd see out of an airplane, so it felt more normal than I would've thought. I love scuba diving, though, and I know that is not everyone's bag, so I'm still pleased I gave paragliding a go. On Sunday we visited the Maspalomas area so that I could see the sand dunes, which were beautiful, and I got a taste of the Maspalomas beach as well which is a tourist hotspot (it turns into Playa del Ingles, which is the most well known) and was absolutely crammed with people. I prefer the beach at Las Canteras in Las Palmas or in Arinaga, honestly. Then we went up to see Sella, finally, and her place was great! She runs a retreat center called EcoTara where groups with instructors book in to run yoga and other health and lifestyle retreats. We spent a lazy afternoon there, and the drives along the way both coming and going were spectacular as well. Then we took my show down (the other exhibition in the adjoining space kindly babysat mine as well over the weekend), and I went down to Arinaga to rejoin Silviu, who had been busy scoping out opportunities for me to have a second exhibition down there, because he's just that lovely of a person. We spent the next day figuring out where I'd have the second show, and La Canela y Hierbabuena said they'd love to have me. I just completed a new piece of artwork - the second companion piece to Pilgrim. I had intended to do at least two from the start, but it took a while to find the studio time to devote to the second piece. In this one, I wanted to achieve a real sense of depth in my relief without being cartoonish. My aim was to maintain the possibility of illusionism from some angles - particularly that of the shallower sections. 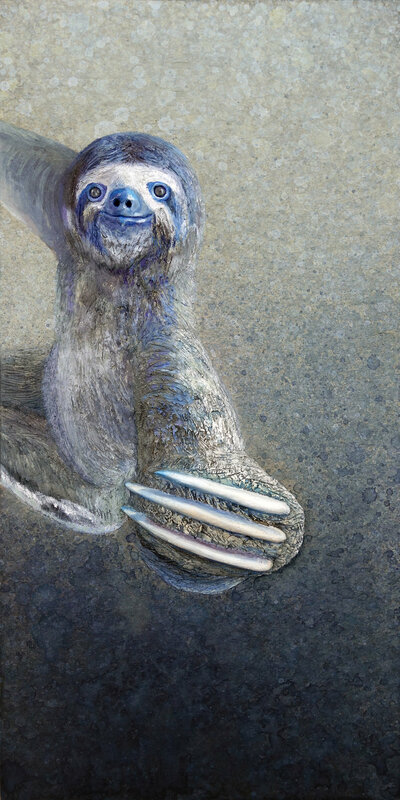 With Pilgrim, there is a relatively shallow relief over the entirety of the sloth's body. 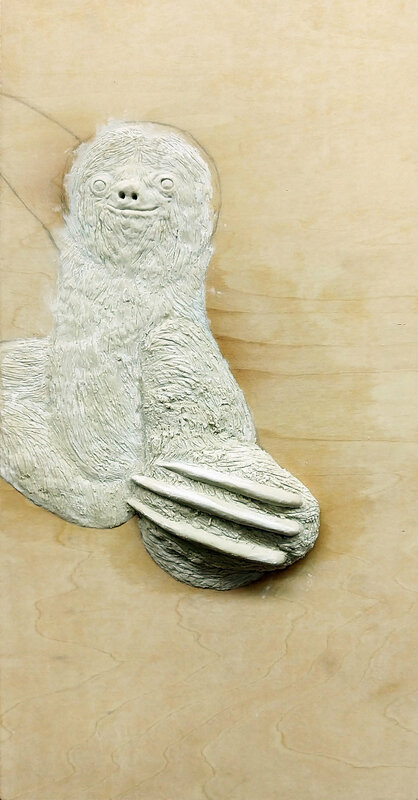 In this new piece, the sloth's body contains an area that is solely painted with no relief at all and then extremely shallow through rather bold relief. I'm considering titling this one Outreach. It's Quick Cure Clay and acrylic on basswood panel, 12x6x1.75", 2018. Due to the dimensions of the piece, it shows up quite large below; if you click on it though it will open up in an overlay that depending on your monitor and settings will probably be smaller and more of a gestalt. Below you can see a couple in-progress photos of the relief work before I applied paint.